[New York], September 16, 2014 - Here is Part II of my New York Fashion Week catwalk critiques, read Part I and Part III. Sophie Theallet Spring 2015 looks cool and slightly eighties. Carolina Herrera's beautiful prints. When Donna Karan makes beautiful dresses. She does this a lot. 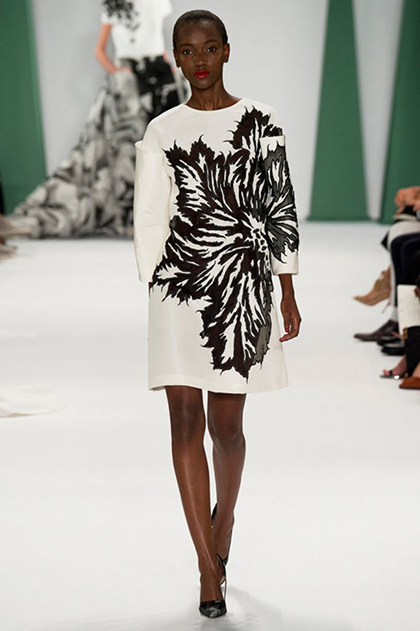 Another beautiful placement print at Caroline Herrera. The way this shirt twists at the waist. This is another great Donna Karan show. More dress perfection at Donna Karan. A really cool one piece at Ohne Titel. Vera Wang's cute black dresses. Nothing new or exciting but makes me want to go out partying.